Buying a new hot tub spa can be a complicated task. With so many brands and designs to choose from, one goes through great risks of wasting money on tubs made with poor craftsmanship. Even with discount hot tubs, one should not be mislead on spending on inferior products. This is why it is important to understand how a hot tub and its parts function as you go through different spa models. Being familiar with spa jargons and how new technology improves performance will also go a long way. For most users, aesthetic qualities tend to be the most important factor when selecting hot tub spas. This is not surprising because choosing the color, shape and design can be easier and more exciting for most people rather than comparing based on the more technical aspects such as motor power, lining thickness and energy efficiency. However, both physical attributes and performance are equally important, and there is nothing more rewarding than knowing that you have just purchased a spa that not only looks good but one has great potential to last a long time. When inspecting for a spa’s surface appearance, you may begin by going through its finish to check for consistency and coating quality. Make sure that it is free from any cosmetics defects like dents, cracks or craters. Conduct close examination on all visible hot tub parts including the seats, lighting, control panel, buttons and drains. Go over the tiniest details and leave no part unchecked. Stay away from flimsy and tacky looking parts if you are going for that sophisticated look. Cabinets that form the outermost housing of non-in-ground hot tub spas are made from various materials like tiles, wood or synthetic wood. It does not only provide support and protection for the delicate tub parts but it is the most noticeable as it covers the entire unit from all sides. In cases when repairs and maintenance are needed, easy access to internal components and hot tub filters must be available. Like any other parts, cabinets must not look cheap and must be solid in construction. Information on UV resistance levels and how to protect your outdoor hot tub from long hours of exposure to sunlight is another useful feature to know.Testing systems for temperature fluctuations is also vital in extreme weather conditions. Choosing portable hot tubs and placing them outdoors where they are exposed to harsh elements would also require research on proper maintenance and usage. For a machine that supplies hot water, insulation is crucial. A well-insulated hot tub spa usually has thick layers of solid foam or fiberglass for its inner lining. When it comes to warming up water, conventional spas keep it safe by having the heaters fitted around water pipes hence preventing contact with water. Big spas naturally have powerful motors and heaters in order to meet water and temperature requirements. Small hot tubs tend to consume less power and need less time to heat water to reach desired temperatures. But regardless of size, hot tub covers are highly recommended for minimizing heat loss. 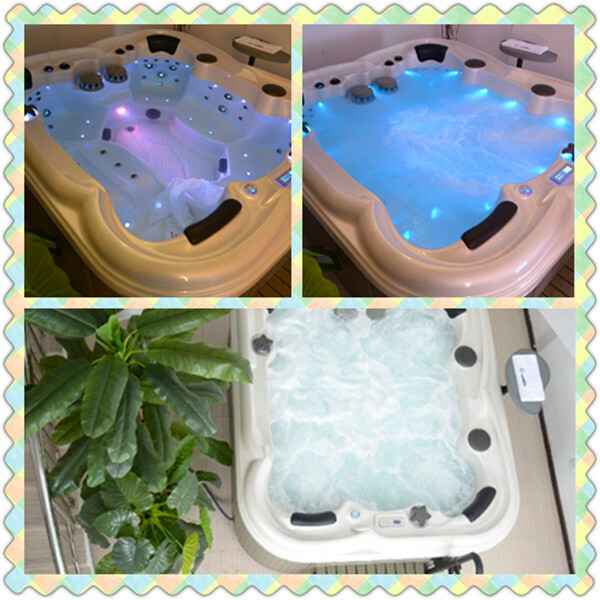 All hot tubs and spas are equipped with filtration system and pumps and both can be accessed through cabinet doors. This is because filter cartridges attached to filtration system must be replaced every once in a while to ensure clean and safe water. Make sure to look for a spa that has provisions for hassle-free means of changing filters. Meanwhile, pumps that circulate water are connected to the motor which is another reason for you to be understanding motor horsepower and taking it into account when you start to inquire at warehouses and hot tub supplies stores. If you are purchasing a hot tub spa for its massage facilities and hydrotherapy, you may prefer one that contains several water jets which serve to stream water to create that massage effect that we all love. Hydrojets are placed on different places around the spa and there are certain models that allow for customizing the number of jets. Hot tub accessories that are usually sold separately when you buy a new tub are also available to elevate anyone’s spa experience. One can choose from a TV, DVD system, pillows especially designed for spas, multi-colored lighting and a feature called waterfalls which mimics that body of water with water cascading from the top. Now that you know how to get your hands on high grade hot tub spas, it is time to look at what one can get out of lounging and frolicking in a spa hot tub. Sitting on a spa has been proven to have positive effects on physical and emotional health. Warm water combined with massage jets that target the back and other important parts of the body can promote relaxation. It is the perfect regimen after a a busy day at work or an intense workout as it causes blood vessels to dilate and improve blood circulation which assists in distributing nutrients needed to repair tissue and therefore alleviating muscle or joint pains. It can also be an effective treatment for headaches and sleep deficiencies induced by stress. Routine soaking in spas and hot tubs can also help relieve arthritic pain, and it can be effective in controlling diabetes as well as hypertension. A research conducted in Colorado which aimed to study the effects of soaking in hot tubs spas for at least 30 minutes for six days revealed a 13% drop in the glucose levels of the participants. It was then concluded that sitting on spas can help lower glucose levels and blood pressure. Other serious ailments where such habit proved to be helpful would be Multiple Sclerosis, Cerebral Palsy, depression and Carpal Tunnel Syndrome. The combination of buoyancy, massage and heated water helps to sooth tired bodies and calm minds. When done regularly, hydrotherapy through hot tubs and spas can help treat chronic conditions and facilitate overall well-being. This entry was posted in hot tub reviews, hot tubs for sale, luxury, Portable hot tub, spa and tagged best hot tubs, cheap hot tub, hot tub reviews, relax, spa for sale. Bookmark the permalink.